These days it’s hard to feel comfortable when you leave your home on vacation. How can you relax if you don’t feel your home is safe! Personally we’ve taken many steps to secure our home because there were a lot of break-ins happening in our South Florida neighborhood. We decided to go all the way with home security. After a lot of research we did everything you’ll see in this article, and we’re always looking for new things to add. The following are some effective home security tips, from the free or inexpensive, to the more expensive. There are even a couple of unusual options that you may not have thought of. Keep in mind that some thieves really research your home before deciding to target it, and some don’t. Either way, if you make your property more challenging to handle, it can be enough to discourage any break-ins. 1. Don’t post about your trip on social media until you return. 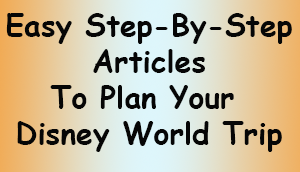 This comes up all the time in my facebook group, Walt Disney World Made Easy for Everyone. If there’s one thing most of us Disney fans have in common, it’s that we get so excited when we’re booking and planning a trip that we want to tell everyone about it. We want to post countdowns, and share our thrill when the trip is getting close. We want to share the fun! BUT… I just think of my next door neighbors. Their son posted a photo while he was away on vacation, and mentioned that they were there at that time. Their house was broken into that night, and they lost over $50,000 worth of items. They had to drive home from their vacation that night. Lesson learned! Don’t give in. Just say no! Don’t post your vacation dates on social media, and don’t post anything that gives away that you’re on vacation while you’re there. Some folks choose to have people they trust stay in their home while they’re away, so they feel their home is protected and they can post their vacation on social media. 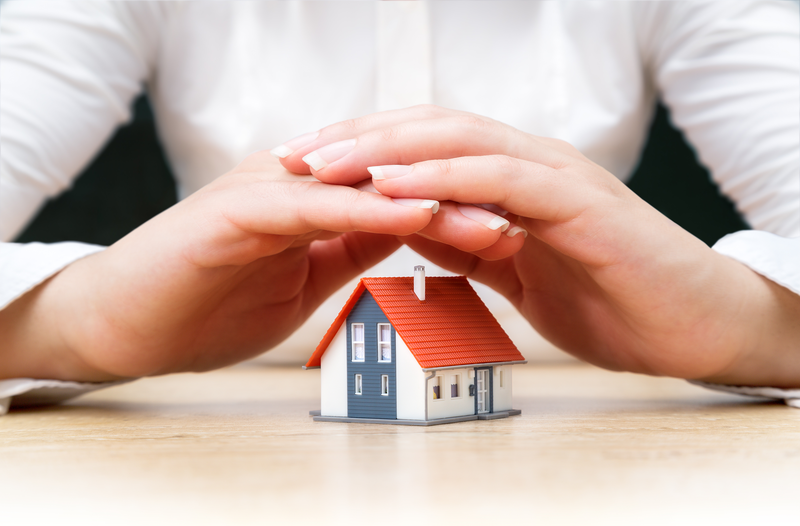 Having someone stay in your home is a great idea, and can definitely increase your home’s security, but it’s not full-proof protection. The person staying in your home has to leave at times, and consider that thieves could still target your home just because they THINK you’re away. This could even lead to a break-in while someone is in the house. Even if you’re having people stay in your home, it’s still not a good idea to post about your vacation on social media. 2. Tell as few people as possible that you’ll be away, and don’t tell the post office or newspaper. I know you’re excited, but the fewer people that know, the better the chance that the wrong people won’t hear about it. When we’re going away, I do tell my family and the neighbors who live right around me so they can watch my home. In my opinion, I don’t feel it’s wise to inform the post office or any other delivery service. There’s just no way to know who may have access to that information. We ask our neighbors to take in our mail, and to check our front door for packages if we expect any. If you get newspaper delivery, ask your neighbor to take that in too. 3. Put your indoor lights, TV and radio on timers. Having your lights, radio and TV on a timer goes a long way towards making it look like you’re home. We even keep some of our light timers on even when we are not away, in order to keep the appearance of some regularity when we are away. When you put your radio or TV on a timer, make sure it’s loud enough to be heard at your door. 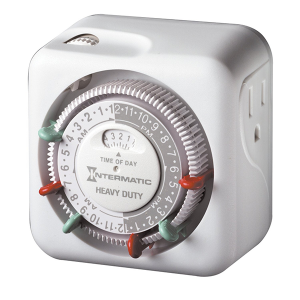 We bought these Intermatic Heavy Duty timers years ago and they still work well for us. What I like about this one is that you can program three different times to turn the radio, TV or light on and off in 24 hours, which will seem natural and as if there’s someone home. You can even add more on/off times if you get additional trippers. We have them in different rooms of the house, set for different times. It plugs directly into the wall outlet, and your appliance plugs right into it. It’s very easy to use. The directions are on the Amazon page so you can see just how simple it is. There are also Digital Timers if you’d prefer. They may be just a little bit easier and more user friendly. 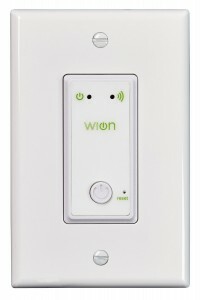 This one allows for 8 on/off settings in a 24 hour period, which is great for security purposes. If I were going to buy new ones, this is the one I’d buy. 4. Put your outdoor lights on timers. I like the idea of having the lights come on and off around the same time every evening and morning when I’m home, and also while we’re away. This regularity is just one less cue to thieves who are looking for signs that you’re away. That would require an indoor programmable timer light switch like this one here. 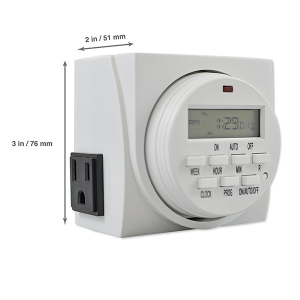 This type of timer on the left will turn on and off your outdoor lights. It replaces your existing wall switch, and in addition to outdoor lights, it can automate overhead lights and ceiling fans. We have two of this kind of unit, which we have programmed to turn on our outdoor porch lights and other outdoor lights every evening. We keep them on until around sunrise, when we have them automatically turn off. I think this is effective for several reasons. First it keeps our home lit up, which will be a deterrent to anyone who doesn’t want to be seen breaking in. Second, we don’t have to remember to turn the lights on and off each day, and if we’re out or away, it’s done for us. I hired a handyman to install mine. This particular timer above has sun tracker technology, countdown mode and random security setting. All of these would be great for security purposes. It comes with a free app that works with Apple (iOS7+) or Android (4.0+) smart devices, which will work with up to 12 devices. 5. Keep a car in the driveway if possible, and/or cover garage windows. This is a simple thing to do if you have a second car, BUT… if the only time you keep your car in the driveway is when you go away, that could signal thieves that you’ve left. You may wish to start leaving your car in the driveway periodically well before your trip if you plan to do this. When we’re home, we usually leave our cars in the garage, so we used white paper to block all the garage windows. This way thieves can’t look in and see that there are no cars there. Make sure the paper isn’t see through, even with a flashlight shining through. 6. 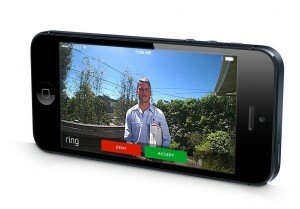 Use this Ring device to see and talk to anyone at your front door, even if you’re away. This Ring device here is a GREAT way to have it look like you’re at home, even if you’re not, for a reasonably low price. We just got this for ourselves. Thieves will sometimes ring your doorbell to see if you’re home. If no one comes to the door, they know they can move forward with their plans to rob you. With this device, you’re able to answer your door from anywhere! You can see who is there, and you can talk to them. They can’t see you so they don’t have to know that you’re not home. It also has a motion detection system so you can be alerted if there’s activity around your front door. It has an HD camera with night vision, so you get a clear view from your front door, day and night. It also includes cloud recording. You can get more than one and place them around your house. You’ll be notified on your phone whenever the motion detector goes off. Even if we are home, we sometimes have a stranger ring our doorbell, and we don’t want to open the door if we don’t know who they are. This allows you to talk to them without opening the door. This can help you avoid a home invasion type thief. It comes with everything you need to install it, and it has great directions (including video directions on youtube). You can connect it to your existing doorbell wiring, or you can use the built-in chargeable battery to install it anywhere you want. 8. Use outdoor security cameras. 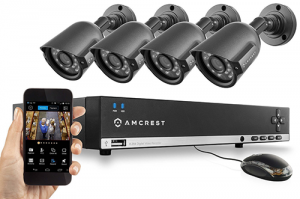 Years ago we purchased a set that included a number of cameras that record to a DVR. This video security system is similar. The cameras were placed all around our home and are visible from the street. A couple of times when our neighbors homes were robbed we were able to supply the police with video of the event. I believe this is a great deterrent. Thieves are less likely to choose a house with cameras when there are other homes without cameras. We have signs in front and in the back of our home saying that everything on the grounds is being filmed. While you can buy these signs on Amazon and put them up without actually having cameras, many thieves will know what to look for, and may not be deterred by the sign without any cameras showing. If you’re not handy you may need to hire someone to install the system and cameras. 9. Apply security film to windows, or get impact resistant windows. You can see security film here on Amazon. We hired a company to apply a protective coating to the windows. The coating prevents the glass from breaking, so it would take a massive effort to break a window enough to get through it. Even if the glass is broken, the film will hold the window together. It can significantly slow or prevent entry through a window altogether. 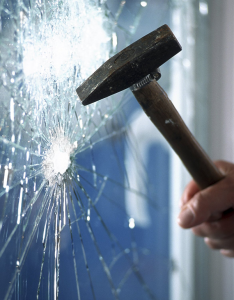 The longer it takes to break a window, and the more smashing a thief has to do, the more likely it is that they’ll get caught. It can discourage them from sticking around your house. There are additional benefits. Our window film provides shade and prevents 99% of UV ray’s from coming in, which reduces our electric bill and keeps our home cooler in the warm weather. The coating also provides privacy. It makes it difficult to see inside, but it’s easy to see out. We didn’t apply it ourselves because once it’s on, it would be difficult to remove. We didn’t want any bubbles under the film, so we decided to bring in a professional to apply it. For some areas, your city code may require it to be installed by a certified installer. Impact resistant windows will also increase home security. These windows usually have a strong polymer layer sandwiched between two sheets of glass. This makes them extremely strong and difficult to break through. Our neighbor just got them here in South Florida for added home security as well as for hurricane protection. In addition to the additional security, they can reduce noise inside your home, and lower your energy costs. 10. Hire a security alarm company. In South Florida, almost every home has a security alarm system. It’s considered a necessity. In other areas of the country it may not be as common, but if you’ve had break-ins in your area, I’d seriously consider doing this. The alarm is attached to all our doors and windows, and we have a motion detector inside the house. Our system is set up to transmit a signal even if the phone lines are cut. If the alarm goes off, a central security station is alerted. They contact us, and call the police. So if anyone causes an impact on one of our windows, opens a window, opens a door, or moves inside our home when the alarm is set, a very, very loud alarm will go off. In addition to the police being called in, our neighbors all come out to check on any home with an alarm that’s been set off. We have signs around our house showing that it’s protected. This all goes a long way to discourage a thief. There were some initial costs up front, and we pay approximately $35 a month, give or take. We feel that it’s well worth the cost for the peace of mind and protection it gives us. 10+. 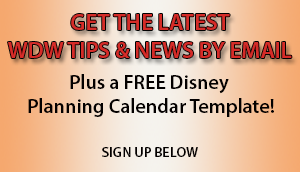 Here are some additional ideas – some from our Walt Disney World Made Easy for Everyone facebook group members. From Denise Colby – Denise has an adult family member dog-sit in her home when she goes away. If she has to tell someone that she’s travelling, she also tells them that there will be someone staying in her home. From Annie Niece Mike Clevenger – Scan your photos and put them on a removable drive. Put the drive, important papers, jewels and the most important things in a safe, in a safe deposit box or give it to a family member to hold and get on. From Phyllis Zurbaran – Amazon, Target, and Costco all have security systems that you can put up yourself, and link to your smart phones for $100-$150.